Instead of wearing mountains down, evidence from Europe's high Alps shows that glaciers shield summits from erosion, acting as a protective lid. French scientists studied erosion on Mont Blanc, western Europe's highest peak, below and around its glaciers. Ice at the highest points froze to the mountain rock and played little part in erosion, the team said. In contrast, water and rain eroded glacier-free areas 10 times faster than areas protected by the glacier. The research was part of Cécile Godon's doctoral research at Université de Savoie, located on the edge of the French Alps, and appeared in the journal Earth and Planetary Sciences Letters. The study focused on the Bossons glacier, which flows down the northern face of Mont Blanc towards the French town of Chamonix. Rock debris, carved from the mountain at the toe of the Bossons glacier and sediments washed out in high mountain streams were compared with erosion in nearby glacier-free areas. 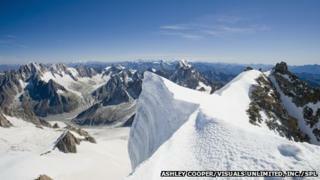 The researchers found that the cold glacial ice protected the mountain from erosion, rather than promoting it. These results may explain the high altitude of the Alps. Driven by the tectonic collision of Europe with Africa, the high alpine bedrock is rising about one millimetre each year. Glacier-free areas of the Alps erode at a similar rate but where the mountains are protected by ice, the peaks wear away at one tenth that rate. Fritz Schlunegger, from Bern University, Switzerland, was not involved in the work and commented: "This group has used sediments at the end of Bossons glacier to determine where erosion is happening beneath the ice. "Most material has been derived from the non-frozen part the glacier, while higher up towards (the summit of) Mont Blanc - where the glacier is frozen to the ground - erosion is much less," he told BBC News. "This is really the first time, according to my knowledge, where this has been convincingly shown in a quantitative way and using a natural example. "However, mountains don't grow to infinity, so there must be another mechanism which has lowered the summit of Europe. According to (Dr) Godon's findings, this erosion is not related to glaciers, so we still have to think about other possibilities." Around the globe, mountain glaciers - especially those at low latitudes - are retreating in response to climate change, scientists say. Reports earlier this year indicated that glaciers around Mount Everest had lost more than one eight of their area in the past 50 years, and the snowline had retreated 180 metres up the mountain sides. Dr Godon's results suggest that changes like these could change the shapes of the world's highest mountains, and that climate and mountain landscape are intimately linked.